Leading media stakeholders in Pakistan are gathering next week in capital city Islamabad to join hands for the challenging task of combating impunity of crimes against media. With close to a hundred journalists killed since 2001, not a single case has been investigated and the killers brought to justice except one – that of the Wall Street Journalist Daniel Pearl. The gathering on October 8, 2013 will look into the implementation strategies and work plan for the United Nations Plan of Action on the safety of journalists and issue of impunity in Pakistan. 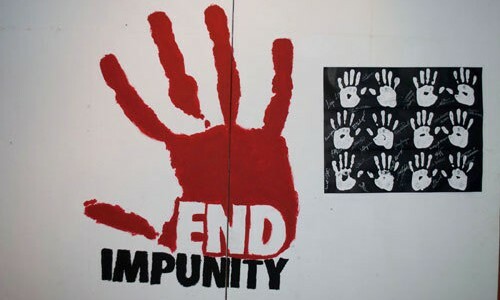 The Plan is being implemented in five pilot countries – Pakistan, Nepal, Iraq, South Sudan and Mexico – to combat increasing impunity of crimes against media. Led by the Steering Committee of Pakistan Coalition on Media Safety (PCOMS) – with members from civil society, senior journalists and media representatives, HR defenders and media support groups – the meeting will have representatives from the All Pakistan Newspaper Society (APNS), Council of Pakistan Newspaper Editors (CPNE), Pakistan Broadcasters Association (PBA), Pakistan Federal Union of Journalists (PFUJ), Radio broadcasters Association (RBA), friends of media in Parliament, civil society groups, government ministers, Human Rights Commission of Pakistan (HRCP) and implementing partners of the United Nations. The UN Plan of Action tries to facilitate key stakeholders, including the media, the state, government authorities, civil society and international media support organizations to undertake joint and collaborative actions to combat impunity. The actions supported by the UN Plan of Action may range from appointment of a special prosecutor to investigate crimes against media and its practitioners, seeking legal recourse in pursuance of justice for the victims, enactment of special legislation to protect journalists, drafting of safety protocols for media houses etc. The meeting in Islamabad comes at a time when six journalists have been killed in 2013 so far in line of duty and Pakistan has been tagged “the most dangerous country for journalists” for two consecutive years by global media watchdog organizations, such as the Committee to Protect Journalists and Reporters Without Borders. In 2012, the 13 journalists were killed in Pakistan and 10 in the year 2011. The award-winning media freedom activist pins hopes on the anti-impunity platform to deal with the disturbing trend of impunity. “This platform can be very effective if all the stakeholders come to the meeting with full backing of their organizations,” he hopes. “The Steering Committee can work as complaint cell and also take up cases of attacks on media and come up with annual report on the state of press freedom in the country. Adnan Rehmat, Director Media Development Initiatives at Civic Action Resources, who monitors attacks against media and has been lobbying for some years for concerted action says there is a consistent pattern of attacks against journalists and growing impunity of the attackers. “Over 60 journalists have been killed in the last 6 years at the unacceptable average of nearly one a month – and only if all key media stakeholders, civil society and the government come together and evolve a joint strategy,” he says. “The UN Plan of Action provides the umbrella under which all the disparate efforts at combating impunity can be coordinated and the PCOMS platform provides both the opportunity and mechanism to deal with the menace of impunity by evolving a joint strategy. PCOMS actually provides a role model for other countries of collaborative action in fighting against organized attacks on the media,” Rehmat adds. Pakistan urgently needs to set up office of special prosecutor to look into attacks on media in Pakistan. To investigate the killings of journalists and bring perpetrators to justice, some cite the case of Mexico that has successfully brought down the number of journalists killed there through legal action.